A chemical derived from an ancient Asian remedy has been shown to make rats almost immune to the effects of alcohol. Researchers at UCLA have demonstrated that rats, which respond to alcohol in a very similar way to humans, can consume large quantities of alcohol without passing out. They tested one ingredient - called DHM or dihydromyricetin in the rats. When given DHM, the rats could 'handle' their drink better. They took longer to get drunk, and seemed to sober up in about 15 minutes. Researchers also claim that the chemical seems to block the process by which addiction to alcohol takes place. When you drink alcohol with DHM, you never become addicted,' says the lead researcher, Jing Liang in research published in Journal of Neuroscience. While sf writers are not more prone to high alcohol consumption than other people, sf writers do seem to spend a fair amount of time describing imagined ways that people might avoid the deleterious effects of alcohol consumption. 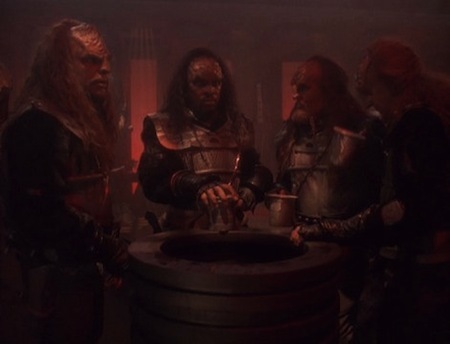 In the episode Apocalypse Rising, Starfleet officers are placed in an impossible position; trying to match Klingons drink for drink in an all-night partying competition. Worf informs the crew that the celebrations are an endurance test, and that only those who can drink and celebrate for the whole night and remain conscious the following morning will be inducted into the Order. This is very similar to the killalc pills described in Harry Harrison's 1970 novel The Stainless Steel Rar's Revenge. From the Daily Mail; thanks to Moira for passing this story on with references!